Deployed within a high-performance Cloud visualization system. Providing simple yet configurable interface to automate the access of on-demand cloud resources. Parallel GPU-enabled visualization engine. Parallel visualization is performed on a multi-GPU cluster using Compute Unified Device Architecture (CUDA). The dust storm dataset is produced from a regional climate model WRF-NMM (WRF: Weather Research and Forecasting, NMM: Nonhydrostatic Mesoscale Model; Huang et al. 2013). It is about 390M in size. 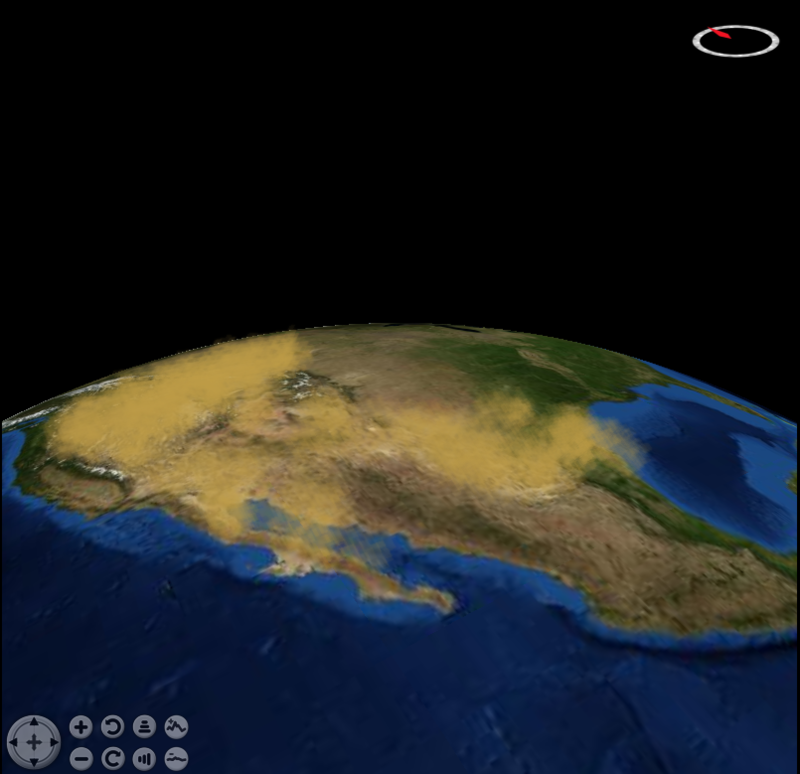 The “dust” dataset contains the information of dust dry deposition load (μg/m2), dust wet deposition (μg/m2), total dust load (μg/m2), and surface dust concentration of PM10 aerosols (μg/m3) at four dimensions: latitude, longitude, time, and pressure. Scientists can exploit our remote visualization system to interactively examine the spatiotemporal variations of dust load at different pressure levels. The atmospheric flow dataset is generated by the Dust REgional Atmospheric Model (DREAM) (Nickovic et al. 2001). 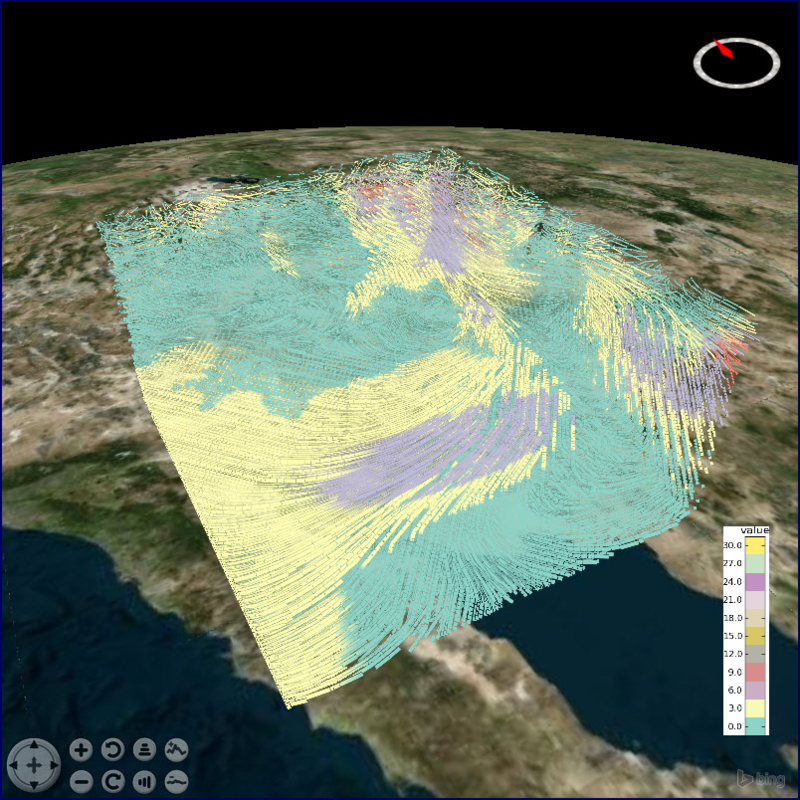 The dataset was a result of a 72-hour dust condition simulation, from July 1st to July 4th, 2014. The simulation area is located in the Southwestern United States with a resolution of 0.027 degree (about 33km). 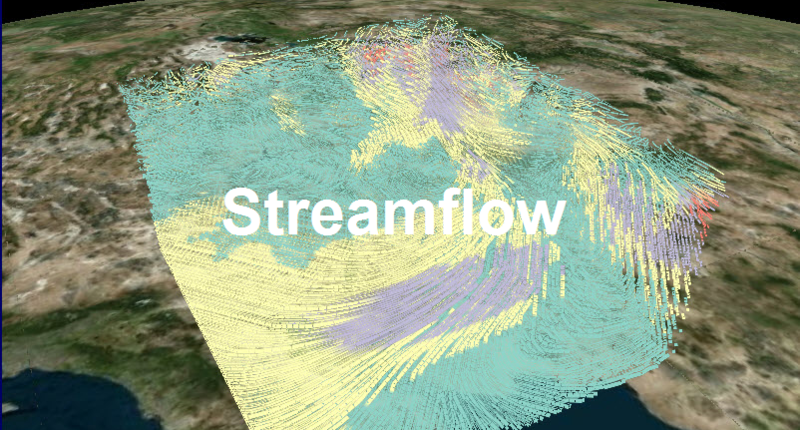 The “flow” dataset contains the information of atmospheric conditions (e.g. precipitation, wind speed and direction), land surface conditions (e.g. soil moisture and temperature), and dust conditions (e.g. dust concentration, dust load). To view the interface, please click on "OUR APP" button (the system's functions are disabled now . To perform realistic visualization tasks, please request Amazon instance by clicking the "Request Resource" button below). Please note the Amazon instances are only open to reviewers for operational cost reasons. If you are anonymous referee, please click the registration button below to let us know the journal you are reviewing, the number of requested instances, your preferred launch time. By default, we will allocate 1 hour of computing time for your test. Please direct your any further questions to zhangt@whu.edu.cn, Jing.Li145@du.edu. Thank you for your precious time and we look forward to your valuable comments. Ray casting is a volume rendering algorithm. After loading the entire dataset for every GPU node, the rendering engine will divide the current screen into sub-regions, each of which will be processed by a single GPU core to produce 3D volumetric images, using ray casting volume rendering algorithm. Finally these images are merged to a global view according to their depth orders. 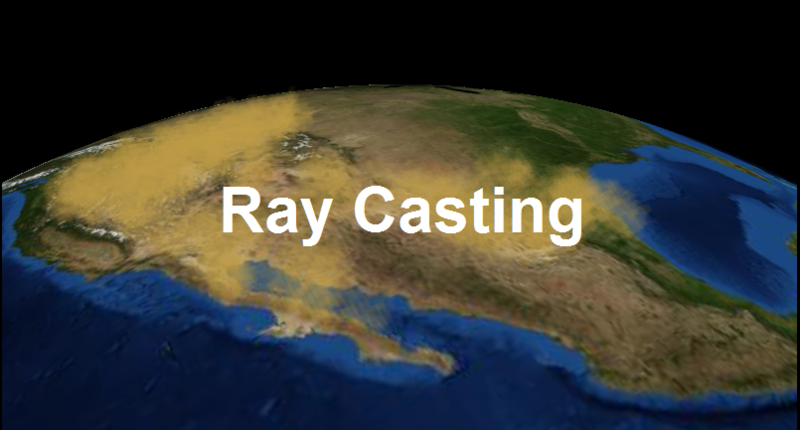 Ray casting is view-dependent and requires multiple passes to finalize. It is more computationally intensive than isosurface and streamflow rendering. However, rendering cost of ray casting is relatively low given that pixel buffer objects are fast to display. 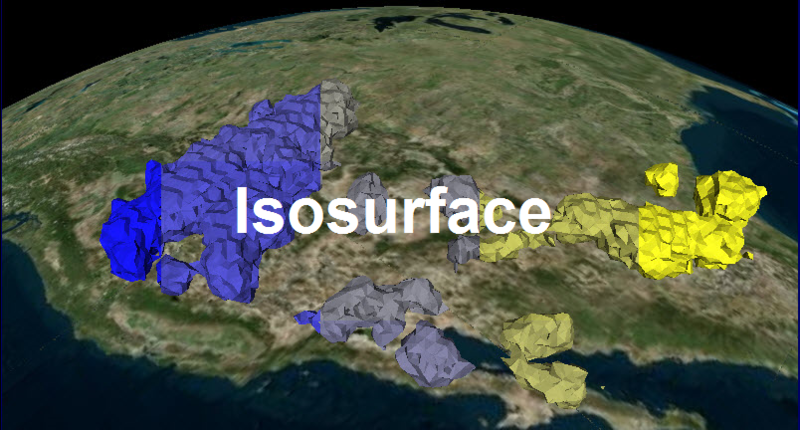 Isosurface is a volume rendering algorithm. After loading the entire dataset for every GPU node, the rendering engine will divide the current screen into sub-regions, each of which will be processed by a single GPU core to produce 3D volumetric images, using isosurface volume rendering algorithm. Finally these images are merged to a global view according to their depth orders. Different from ray casting, isosurface algorithm can be finished in one pass. Despite that this solution algorithm is not costly, drawing visualization results on screen could be slow. Stramflow is a flow rendering algorithm. After loading the entire dataset for every GPU node, the rendering engine will identify wind direction and origin of streams, and divide stream origins into batch origins. Stream lines for each batch origin will be processed by a single GPU core to produce 3D flow line images, using streamflow rendering algorithm. Finally these images are merged to a global view according to their depth orders. Different from ray casting, streamflow algorithm can be finished in one pass. Despite that this solution algorithm is not costly, drawing visualization results on screen could be slow.